A Leishmania model to explain microbial virulence in chronic infectious diseases is proposed. All these diseases progress from infection to symptomatic phase to host death or recovery. The outcome of each phase is depicted to result from the interactions of a distinct group of parasite molecules with a specific host immune compartment. The first group consists of invasive/evasive determinants, which are largely parasite cell surface and secreted molecules. Their activities help parasites establish infection by overcoming host immunologic and non-immunologic barriers. These determinants do not cause disease per se, but are indispensable for infection necessary for the development of a disease-state. The second group of parasite molecules consists of "pathoantigenic" determinants – unique parasite epitopes present often within otherwise highly conserved cytoplasmic molecules. Immune response against these determinants is thought to result in immunopathology manifested as clinical signs or symptoms, namely the virulent phenotype. The third group of parasite molecules is hypothetically perceived as vaccine determinants. Their interactions with the host immune system lead to the elimination or reduction of parasites to effect a clinical cure. Differential expression of these determinants alone by parasites may alter their interactions with the hosts. Virulent phenotype is consequently presented as a spectrum of manifestations from asymptomatic infection to fatality. A secondary level of regulation lies in host genetic and environmental factors. The model suggests that different parasite determinants may be targeted by different strategies to achieve more effective control of leishmaniasis and other similar diseases. Some Leishmania species are inherently endowed as pathogens, as they cause diseases collectively known as leishmaniasis. The degree of their pathogenicity, traditionally defined as "virulence", is manifested as a spectrum of clinical symptoms in human diseases . Those causing a self-healing cutaneous leishmaniasis are considered as less virulent than those causing the potentially fatal kala-azar or visceral leishmaniasis. Disease entities with graded clinical severity exist between these two extremes. Although Leishmania virulence may be modulated by environmental and genetic factors of their mammalian hosts , and sand fly vectors , molecular determinants of Leishmania spp. are the key elements. This is considered to be the case, since there is no leishmaniasis without infection by intact living Leishmania. That is, leishmaniasis does not occur, or at least has not been successfully duplicated experimentally, by injection or manipulation of animals with anything other than viable Leishmania parasites. There is no evidence in the literature that Leishmania spp. produce "toxins" in the conventional sense to directly cause the clinical symptoms of leishmaniasis. How Leishmania cause leishmaniasis is thus a complicated issue, involving apparently multiple factors of Leishmania origin. Work undertaken in the past two decades to elucidate host-parasite cellular interactions has made this point apparent. It is clear that Leishmania possess infection-related molecules (=invasive/evasive determinants) , which allow them to establish successful intracellular parasitism in phagolysosomes or parasitophorous vacuoles of macrophages . In human leishmaniasis, these mononuclear phagocytes are invariably seen as the only parasitized cells. They are thus undoubtedly the principal host cells of Leishmania, although experimental evidence exists for leishmanial infection of other cell types, e.g. dendritic cells  and fibroblasts [6, 7]. The association of Leishmania with macrophages at the cellular level is characterized as akin to "symbiosis" . This notion was proposed from observations of host-parasite cellular interactions in the L. amazonensis-J774 macrophage in vitro system . In that case, the infection produces no acute cytopathology or rapid cytolysis of the host cells. It is essentially a self-renewable or self-sustainable host-parasite in vitro system. Since human disease does occur with infection of macrophages in vivo, it is likely that the pathology and clinical symptoms may originate from interactions of these infected macrophages with other elements in the host. We propose here that some parasite-specific antigens, derived from the infected cells, interact with the host immune system in a negative way, directly responsible for the immunopathology manifested as the clinical symptoms seen in leishmaniasis. Consistent with this notion are findings that kala-azar patients produce large amounts of Leishmania-specific, but non-protective antibodies against certain intracellular antigens of these organisms . A hypothetical model is thus proposed accordingly, depicting that Leishmania virulence results from interactions of differentLeishmania determinants with separate compartments of host immune system, namely those for infection and those involved in immunopathology. If the hypothetical model proves correct, the two groups of determinants may be targeted differently by molecular genetic approaches relevant to the control of leishmaniasis. These determinants include most, if not all Leishmania molecules that have been studied as "virulence factors" in the literature (see Fig. 1). All these molecules appear to play certain roles in Leishmania infection of macrophages . 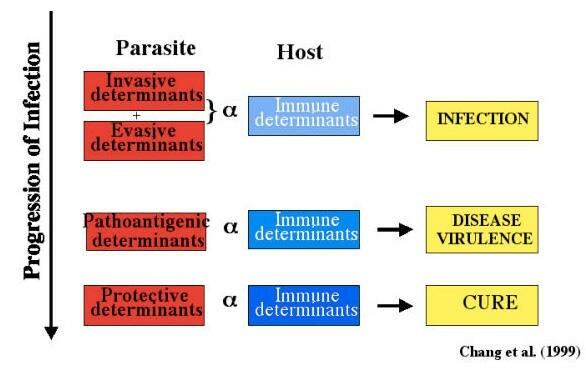 They are referred to here as invasive/evasive determinants because they help Leishmania successfully establish intracellular parasitism in the following sequential events: (A) evasion of humoral lytic factors; (B) attachment of parasites to macrophages followed by their intracellular entry into these phagocytes; (C) the intracellular survival of the endocytized parasites; (D) promastigote-to-amastigote differentiation; and (E) replication of the amastigotes. The categorization of the host-parasite cellular interactions into sequential events pertains to the primary infection of macrophages in the mammalian hosts by promastigotes. Events (A) – (C) and (E) are relevant as well to the secondary infection of macrophages by amastigotes from already infected cells. The spreading of amastigotes to infect additional cells must be considered as crucial for the development of leishmaniasis. However, it may be mechanistically a rather simple event in considering normal functions of macrophages. One of their functions is to scavenge damaged or dying cells and their cellular debris, which may include degenerating cells (due to heavy parasitization), parasitophorous vacuoles and even released amastigotes with adherent host molecules in leishmaniasis. Some invasive/evasive determinants of Leishmania proposed to play important roles in their infection of mammalian hosts. Much attention has been thus devoted to the infection of macrophages by promastigotes, although the manner, by which their molecules (listed in Fig. 1) actually function in infection remains to be elucidated. 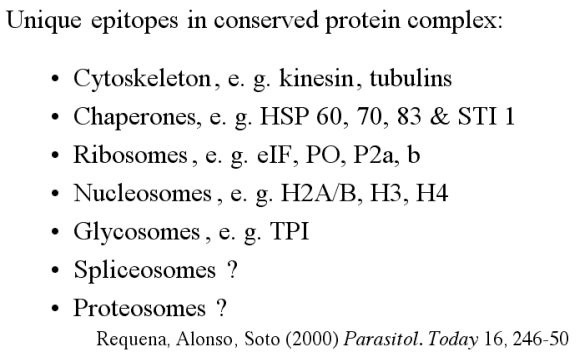 Data obtained from different host-parasite systems are also not always consistent even for the molecules more extensively studied, like gp63 and LPG. Gp63 is an ecto-metalloprotease that is especially abundant in the surface of promastigotes and also released by this stage of Leishmania. Gp63 is known to help promastigotes in event (A) by rendering them resistant to complement-mediated cytolysis . It also appears to act, (perhaps, together with LPG) in event (B), namely infection of macrophages by promastigotes via receptor-mediated endocytosis [13–16]. Both may be important in event (C) for their intraphagolysosomal survival [16–18]. 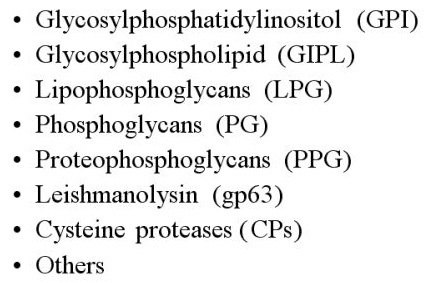 Some of the other molecules listed in Fig. 1 may be involved directly or indirectly in these and/or the remaining events. Parasite molecules involved in events (D) and (E) for differentiation and replication of intracellular Leishmania may have additional functions beyond infection, especially in the latter case. Regardless of the functional and definitional ambiguity associated with these determinants, there is no evidence that they directly cause the clinical symptoms seen in leishmaniasis. For example, repeated injections of susceptible animals with gp63 or LPG do not reproduce the typical symptoms of leishmaniasis, e.g. various types of cutaneous lesions or hepatosplenomegaly and other clinical signs related to kala-azar. Fig. 2 lists a number of Leishmania antigens found to elicit antibodies often at high titers in kala-azar patients . The data presented were summarized from articles published by others and some are proposed hypothetically. These Leishmania antigens are identified by Western blot analysis and/or by immunoscreening of Leishmania expression libraries with patients' sera. Some Leishmania pathoantigenic determinants proposed to cause immunopathology manifested as the clinical symptoms in leishmaniasis. The molecules listed have been found to contain immunogenic B-cell epitopes. Notably, Fig. 2 does not include the invasive/evasive determinants discussed in the foregoing paragraph. This is not to say that patients of leishmaniasis do not produce any antibodies against these determinants. There have been a number of publications, which demonstrated the presence of, for example, anti-LPG and anti-gp63 antibodies in these patients. However, the titers against these invasive/evasive determinants are insignificant in comparison to those listed in Fig. 2. Perhaps, this is not unexpected for a successful parasite, like Leishmania. Since the invasive/evasive determinants often exist on the cell surface and/or are secreted, they bear the brunt of exposure to and confrontation with the host immune system. Evolutionary pressure may well select these invasive/evasive determinants for low antigenicity, thereby escaping from neutralization by specific antibodies and/or other lytic factors to ensure successful parasitism. Another striking feature of those listed in Fig. 2 is that they are all conserved structural or soluble cytoplasmic proteins, which are often complexed with other molecules to form subcellular particles. Although some of them, e.g. histones and heat shock proteins, are seemingly shared with those found in autoimmune diseases, they are not cross-reactive. Epitope-mapping reveals unique Leishmania sequences, which are recognized only by sera from patients with kala-azar . One example worthy of mention is the unique 117 bp repeats in the Leishmania kinesin-like gene . It is expressed by the amastigotes of visceralizing Leishmania, but not by cutaneous species. Sera from human kala-azar patients contain antibodies specific to the 39 amino acid peptides encoded by the 117 bp repeats (recombinant products =rK39). Anti-rK39 antibodies reach exceedingly high titers as much as 10-6 in Indian kala-azar patients . Although this antigen has been used successfully for serodiagnosis of active kala-azar cases, it is difficult to assign any protective function for the specific antibodies at such high titers produced against this and other similar antigens. The antigens of concern are in the cytoplasm of intracellular amastigotes and thus beyond the reach of these antibodies. Their potential contributions to immunopathology are apparent, e. g. albumin-IgG ratio reversal in the plasma and hyperplasia of plasma cells in the lymphoid organs in kala-azar. Similarly, some Leishmania-specific T-cell epitopes may also exist and cause additional immunopathology, although these epitopes have not been extensively studied in human leishmaniasis. Recent work in the direction of elucidating protective immunity has identified T-cell epitopes, which exist also in Leishmania cytoplasmic molecules . Fig. 3 depicts schematically Leishmania invasive/evasive- and pathoantigenic determinants as different groups of parasite virulence-related molecules. Presumably, they interact sequentially with different compartments of the host immune system to cause leishmaniasis. The invasive/evasive determinants of Leishmania help them overcome the host immune and non-immune barriers to establish intracellular infection of macrophages. This infection by itself does not cause the disease, but it is a prerequisite for this state. Infection must be maintained in order for the transition from asymptomatic phase to symptomatic phase, especially when host immunity becomes down-regulated. The latter event alone produces no leishmaniasis without persistence of the infection. The invasive/evasive determinants are thus virulence factors in that sense, even though they contribute only indirectly to the virulent phenotype. During the subsequent chronic course of infection, it appears that some intracellular amastigotes are killed or lysed inadvertently due, perhaps, to the incomplete protection by their invasive/evasive determinants. As a result of this, some cytoplasmic molecules of amastigotes are exposed to the host immune system. The resulting immune response to these unique epitopes does not contribute to the anti-Leishmania immunity, but to the clinical symptoms observed in leishmaniasis. Thus, Leishmania determinants of infection and immunopathology are considered here as different, but sequentially necessary components for the expression of virulence. A hypothetical model to explain virulent phenotype in leishmaniasis. The three groups of determinants are thought to interact with host immune system independently, but may progress sequentially to produce the spectrum of subclinical and clinical manifestions as the basis of virulent phenotypes seen. According to the hypothetical model, it is possible to envision the regulation of Leishmania virulence via differential expression or qualitative differences of the invasive/evasive and pathoantigenic determinants. Virulence is manifested in a clinical setting as a spectrum of human diseases with different severity, ranging from asymptomatic infection to the appearance of self-healing nodules to necrotic, diffuse mucocutaneous lesions to fatal visceralizing disease. Up- or down-regulation of either group of individual determinants quantitatively or qualitatively alone can conceivably result in the spectrum of the clinical outcomes seen. The extreme scenarios of asymptomatic infection and fatal outcome thus may be due to a pattern of varying expression of these determinants. In this view, Leishmania determinants are considered as the driving force of virulent phenotype. Host and vector determinants are undoubtedly involved, but they play a secondary or passive role in natural conditions. Fig. 4 considers Leishmania virulence at the gene level based on hypothetical grounds and on some gene knockout experimental data in the literature. There appear to be three functional groups of genes involved: (A) Positive contributors for the multiple determinants already discussed (Fig. 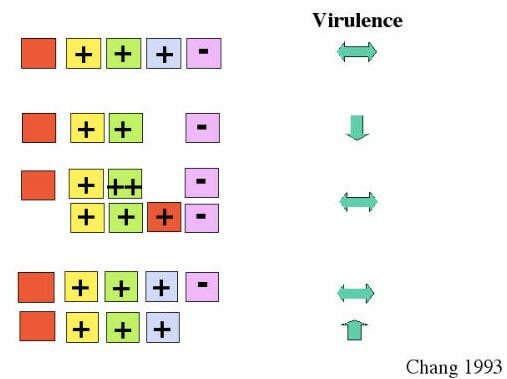 4., Blue, Green and Yellow squares with "+"); (B) negative contributors (pink square with "-") coding for products, which reduce virulence; and (C) facultative contributors (Red square blank), which normally do not participate in virulence, but do so in the absence of a positive contributor. Normally, the virulent phenotype seen in a given condition represents a balanced presence of positive and negative genes with no involvement of the facultative ones (Fig. 4, 1st row, double-headed horizontal arrow). When one of the positive genes is silenced or lost, virulence may decrease, as expected (Fig. 4, 2nd row, downward arrow). Alternatively, it may remain unchanged when the gene of concern is functionally "backed up" or replaced with another positive contributor via up-regulation of its expression (Fig. 4, 3rd Row, duplication of the green squares with "++") or with that of a facultative gene (Fig. 4, 4th row, red square with "+"). This scenario may explain the experimental findings that knockouts of "virulence genes" do not always result in changes in the phenotype expected. Silencing or loss of the negative gene is accompanied by an increase in virulence (Fig. 4, 6th Row, upward arrow). There is at least one example in the literature for the presence of negative genes . Regulation of Leishmania virulence at genetic levels. Blue, Green and Yellow squares with "+", Positive contributors for the multiple determinants discussed; pink square with "-", negative contributors coding for products, which reduce virulence; Red square blank, Facultative contributors, which do not contribute to virulence under the normal conditions. The hypothesis proposed is speculative, especially for the presence of the "back-up" genes. Although they have not been demonstrated experimentally in Leishmania, functionally overlapping genes with very different sequences are expected to exist, in keeping with the proposed contribution of such genes to genetic flexibility in biological systems . If such a strategy should exist in Leishmania and contribute to the regulation of their virulence, the evolutionary pressure of maintaining successful parasitism might favor this mechanisim for the invasive/evasive determinants, but not for the pathoantigenic determinants. Can we temper with Leishmaniavirulence genes to deal with leishmaniasis? More genetic and functional data for the various determinants discussed are needed to consider this question more thoroughly. On hypothetical grounds, it is possible to consider that: (A) the invasive/evasive determinants may be targeted for developing specific inhibitors to prevent infection; and (B) the pathoantigenic determinants may be suitable targets for considering "molecular attenuation" of virulence by gene deletions or modifications, thereby producing infective, but non-pathogenic mutants for vaccination. The schemes related to the second proposal may be more interesting for further discussion. It is feasible to begin the discussion with the self-curing simple cutaneous leishmaniasis. In this case, "host protective determinants" of Leishmania origin are depicted to emerge with the progression of the infection from "disease" to spontaneous "cure" (see Fig. 3). These hypothetical determinants may be the "natural vaccines", which interact with the host immune system in a positive way to cure the disease. Although they have not been identified and isolated, there are ongoing research efforts toward this end . On the other hand, "Leishmanization" has been practiced for centuries by inoculating or immunizing individuals with live Leishmania. Although this process leads to development of cutaneous lesions, it provides life-long protection to re-infection by the same species after cure. It is theoretically possible to improve "Leishmanization" by several potential schemes. One is to genetically engineer parasites with "suicidal cassettes"  for self-destruction as a strategy for vaccination, as has been already carried out in experimental animals . It would be of further interest to improve this by "immunizing" susceptible hosts with such transgenic Leishmania, which are responsive to external signals for their destruction [26, 27] at different times after inoculation. Perhaps, effective immunity could be activated by such manipulation before the manifestation of extensive clinical pathology. "Leishmanization" thus may become more effective or rendered more innocuous. Another possibility is to delete or modify the gene(s) encoding pathoantigenic determinants. Although this is a more desirable approach, it will require a substantial investment to identify and select suitable targets. This is the case, since these determinants appear to be encoded apparently by conserved and thus functionally important genes. Candidates may include antigens empirically identified for vaccination against kala-azar. There may be sufficient incentives to produce such attenuated mutants in considering the potential benefits that they may be used as vehicle for delivery of antigens as vaccines for other diseases. This may be considered in view of the "homing" of Leishmania to macrophages (and possibly dendritic cells). These "vaccines" could be transgenetically expressed by Leishmania for targeted delivery and accumulation in these cells. Antigen processing and presentation may be rendered more effective to achieve desirable immune response. Leishmania virulence has been discussed often in the context of infection-related molecules or invasive/evasive determinants, independent of the pathoantigenic determinants. A hypothetical model is presented to depict infection, virulence and cure as sequential, but independent events. The actions of both groups of determinants in tandem are proposed here to cause leishmaniasis. This hypothetical model is probably applicable to other chronic infections caused by nontoxigenic pathogens. If so, the proposed differential targeting strategies could have broader applications. The actual translation of these ideas for fighting leishmaniasis and other infectious diseases into practical use requires additional studies. However preliminary the schemes may seem, they deserve consideration and discussion for the sake of millions who suffer from these diseases in the developing world. It is desirable to develop field deployable products for preventing these diseases, but this has been hampered by the lack of investment by the pharmaceutical industry. Hopefully, this obstacle will be rendered easier to overcome under the coattails of our renewed interests in vaccines in the war against bioterrorism. The authors are supported by the NIH (AI-20486 to KPC) and the American Heart Association (Physician-Scientist Postdoctoral Fellowship to BSM).